So, the morning of May 11th, we officially embarked on the 2012 Austin BBQ tour. But I’ve found that it’s best not starting your day beginning with a bunch of barbecued brisket and ribs; despite the fact that most of the day was going to be dedicated to eating large quantities of meat, we both decided that it would be a good idea to start things out with some breakfast. And Austin has a rather good breakfast taco scene going on, particularly since it’s a town that already has a large population of taco joints and taco trucks. The previous night’s stand, Torchy’s Tacos has quite the breakfast menu, for example, as does Maria’s Taco Xpress over on South Lamar (we’ll get back to Maria’s in a few posts, I promise!). 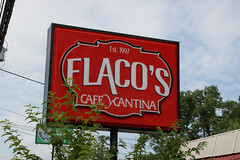 But between our hotel and our first BBQ joint (JMueller) was a fairly simple Austin taco joint: Flaco’s Tacos (aka “El Flaco” or “Flaco’s Caafe”, as it is still has some confused signage). Aside from the slightly odd name (“Flaco” means “the skinny guy”, so it’s like naming your place “Skinny’s”, which always seems a bit odd for a food joint), Flaco’s is your basic neighborhood taco joint. Nestled in a fairly small building that appears to be an example of “Taco Bell Reuse Architecture”, it’s basically an ordering counter, a small kitchen, and a seating area mostly comprising of booths. The menu is similarly uncomplicated: the breakfast menu is, to first approximation: tacos. Breakfast tacos. Of just about any variety you might like, ranging from eggs, chorizo, bacon, barbacoa, beans, cheese, potato, and such. In fact, pretty any combination of these, plus a few specials like a migas, are on the menu. Being someone that likes both the classic breakfast taco with chorizo, and the occasional one that avoids eggs (I’m not really the greatest fan of eggs, to be honest), I opted for a rather simple pairing: one egg and chorizo taco, and a potato and chorizo taco. Basically, both were excellent. Working my way out from the filling, the chorizo in both tacos was flavorful, spicy, and crispy, without being overly greasy. The potatoes were soft, nicely cooked, and not overly started. The eggs were nicely soft and fluffy and not overcooked. The salsa was fresh and bold, and nicely tied everything together. 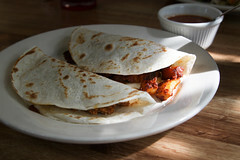 Finally, the tortillas were good, solid fresh-made tortillas that were nicely grilled up. The result was a good solid pair of tacos that set me back only $3.70. 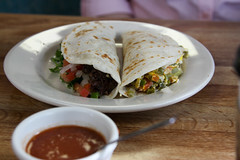 Carol fared similarly well with her selection, opting for one barbacoa taco, and a nopalito (cactus) taco. The barbacoa was one of the best barbacoas she’s had, with nice, juicy, and flavorful chunk of tender meat, while the nopalito had nicely simmered bits of cactus served up with some eggs. Like mine, the tacos were cheap, nicely assembled, and flavorful. I’ve had some better Mexican tacos and burritos, but Flaco’s has a pleasant staff and great prices (Carol’s $2.50 barbacoa was the most expensive item). The portions are large as well, making this a very good breakfast deal.